My first knowledge of Indians came mostly from the cowboy movies of the 1930s and 40s of the plains Indians on horseback surviving by hunting the buffalo. It was only as an adult I learned that before the white man came some earlier Indians had developed villages and an agricultural way of life. Representatives of this more advanced way of life were the mounds Indians widely spread across the Midwest and Southeastern parts of the country. 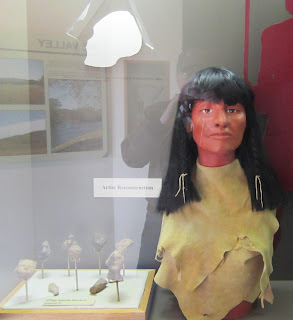 My most recent visit was in Cartersville, Georgia, to the Etowah Indians Mounds, the most intact Mississippian Culture site in the Southeastern US. Several thousand Native Americans had lived on this 54-acre site between 1000 A.D. to 1550 A.D. cultivating corn, beans and squash in the loamy soil flooded regularly by the Etowah River. The artifacts discovered here showed it to be an artistically and technically advanced culture much like the ones that existed in Mexico at the time. Unfortunately the Spaniard Hernando DeSoto came this way in his explorations to find gold and left behind smallpox and measles for which the natives had no natural immunity. It wasn’t long before the town’s population was drastically reduced and the survivors left the area and eventually become known as the Creeks. Having no oral tradition, they forgot that their ancestors had built the large mounds along the river. Outside the visitors center is a model of the buildings that once crowded the area, a wattle and daub hut made of branches filled with wet red clay that soon was baked hard by the sun. The logs set up for fire in the middle of the room with no smoke hole in the roof make me think this could be an unhealthy living area. A display in the center’s museum gives a more complete picture of what the village once looked like. We crossed a bridge over a 10-foot-deep ditch that had been a source of dirt for the mounds and then became part of the defensive structure. A sign explained that inside the moat a 12-foot-high wall of upright logs had once effectively kept enemies at bay. Used as a fish trap, a V-shaped stone barrier crossing the river has been kept intact. Woven river cane baskets were placed at the point of the V to catch catfish, drum and gar an important part of the diet of the villagers. Mound A is 63-feet high and is exceeded in size only by the large mound at Cahokia near St. Louis. Mound A with its earthen platform housed the great temple of the chief from which he presided over ceremonies on the plaza below. During the 1800s the mound was cultivated for farming causing some loss of the top layer. The first well-documented archaeological dig was done in 1925 by Warren K. Moorehead who was known as the dean of American archeology. He spent four winters excavating the site mostly focusing on Mound C. Further work was done later by archeologists from the Georgia State Parks and Historical Sites and then rebuilt. Only nine percent of the site has been excavated, a difficult task since the area is one vast graveyard the Indians having buried many of their dead in the soil and covered them with river cane beds. Mound C had been a burial mound, and the artifacts excavated with the 350 bodies found there indicated they were of high status. One piece of evidence as to the high status of the bodies was the brightly colored cloth with ornate patterns buried with them. In this mound were two almost life-size marble figures of such complexity that it is difficult to understand how they could have been carved without the use of metal tools other than the copper they used in breast plates and copper ear ornaments. These figures are now on display in the museum along with artifacts showing how the people decorated themselves with shell beads, tattoos, and feathers. We were told the images had been found broken and hastily buried, one theory being that successful attackers had broken them and buried them to destroy their power. Other displays give a rather good picture of what life must have been like during that period of history. A movie at the visitor’s center gives a history of the Southeast Mounds Indians, and the park ranger gives an introductory lecture on the area. The site was designated a National Historic Landmark in 1964. A reconstruction of what the Etowah Indians looked like. A V-shaped stone barrier crossing the river was used as a fish trap.